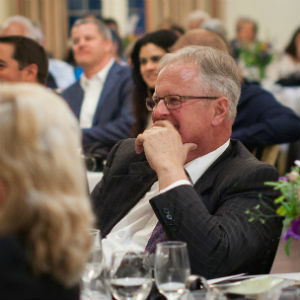 University and college “presidents have to know about fundraising, enrollment, board governance, community and connection,” said Jennifer Braaten at Friday’s farewell celebration for President Loren Swartzendruber and his wife, Pat. Swartzendruber is retiring after 13 years as Eastern Mennonite University president on June 30. Bratton was among nine speakers at the gathering of 135 guests at the Spotswood Country Club celebration; she knows the college presidency well and will retire herself next month after 14 years in the role at Ferrum College in Virginia. Robert Lambeth, president of Council of Independent Colleges of Virginia since 1983, also remarked on the great respect held for Swartzendruber among his colleagues, who voted him to a term as board chair in 2009-10. Braaten and Lambeth joined James Madison University president Jonathan Alger in representing the higher education community. Alger remembered the warm welcome and hospitality the Swartzendrubers offered the Algers when they moved to the community in 2012. This relational style helped to strengthen the ongoing collaboration between the universities, he said. Alger also noted the joy their daughter has experienced as a chorister in EMU’s Shenandoah Valley Children’s Choir. The celebration included family, friends, past and current members of the board of trustees, and President’s Cabinet. Former presidents Myron Augsburger, with his wife Esther, and Joe Lapp, with his wife Hannah, were also in attendance, as well as Sara Wenger Shenk ‘75, president of Anabaptist Mennonite Biblical Seminary, and her husband Gerald, and Jim Brenneman, president of Goshen College, and his spouse, Terry. Though much of the evening was spent in laughter – Swartzendruber’s sense of humor being a characteristic warmly lauded by all speakers –Kay Nussbaum ’78, Board of Trustees chair, and Basil Marin, MDiv. ‘05, Mennonite Education Agency (MEA) board member, each presented lengthy resolutions in honor of the couple. “Over the years of Loren’s presidency, I remember feeling more and more assured and free to teach as I was led,” she added. I Corinthians 13:4-7 was offered as a benediction byKirk Shisler ‘81, vice president for advancement. Love is patient, love is kind. It does not envy, it does not boast, it is not proud. It does not dishonor others, it is not self-seeking, it is not easily angered, it keeps no record of wrongs. Love does not delight in evil but rejoices with the truth.7 It always protects, always trusts, always hopes, always perseveres. Those speaking in appreciation also included James Rosenberger ’68, chair of the 2003 Presidential Search Committee and former Mennonite Education Agency board member; Rick Stiffney, CEO of Mennonite Health Services Alliance; and Sarah Roth Shank ’10, a current EMU employee who completed undergraduate and graduate degrees at EMU and first met Swartzendruber as her high school graduation speaker at Lancaster (Pa.) Mennonite High School. In closing, Swartzendruber noted that his accomplishments listed on the resolutions were “built on the legacy of those who came before” and “with a team of people on campus.” He recognized Orville Yoder and Carlos Romero, former colleagues at Mennonite Education Agency; pastors Phil Kniss and Barbara Lehman, of Park View Mennonite Church; as well as family friends, Mim and Deryl Kennel, and Betty Brunk whose late husband, Truman, preached Loren’s ordination service in 1975.